“Mammy! Mammy! Look! A lion!” “Mammy! Mammy! Look! 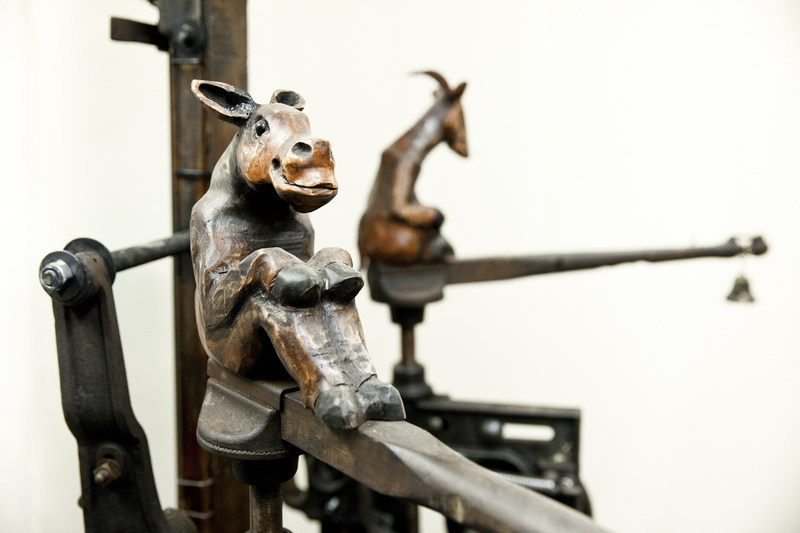 A kangaroo!”… so it went when I took the kids to see the Sharmanka exhibition in An Lanntair. I knew they would love it. How could they not? It’s art in motion, set to a light show, and full of magical creatures who come to life when the wheels start turning and the bells start chiming. Anyone who has any free time this week and hasn’t been to this exhibition in An Lanntair should make a point of going in, before it is wound up this coming Saturday (November 12). It’s downstairs, in the corner of the main exhibition space, and is a fantastic piece of folk art with huge significance to the Outer Hebrides, as it reimagines one of our most iconic instruments. 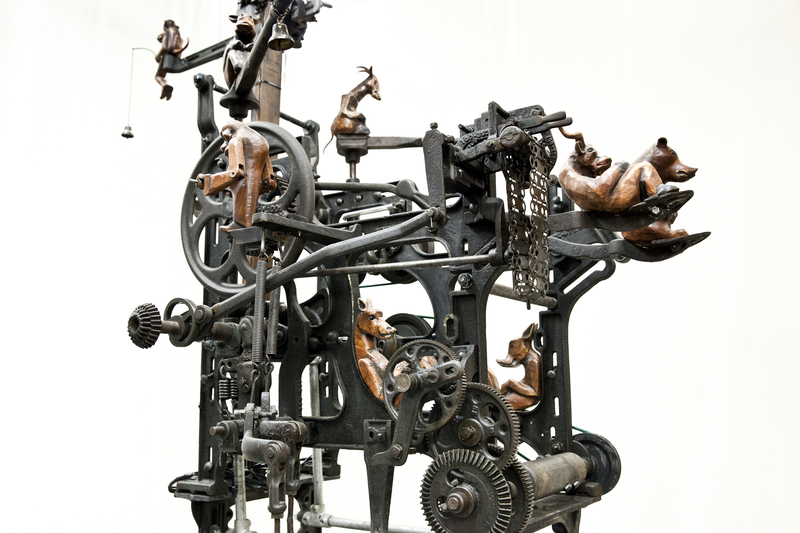 Sharmanka Kinetic Theatre, the Russian company based in Glasgow, have taken apart an old Hattersley Harris Tweed loom and put it together again in a completely different way, as a mechanical sculpture complete with wee wooden creatures that positively gleam with life. This is A’ Bheairt: The Loom. And it couldn’t have been made by anyone but Sharmanka — sculptor/mechanic Eduard Bersudsky, theatre director Tatyana Jakovskaya and light and sound designer Sergey Jakovskaya — who have exhibited in Stornoway twice before. The performance cycle of A’ Bheairt lasts about four minutes — feel free to ask someone at the front desk to turn it on for you — and I must have watched it about 10 times. When I took the children, they were particularly fascinated by the wee wooden animals (known as kinemats). 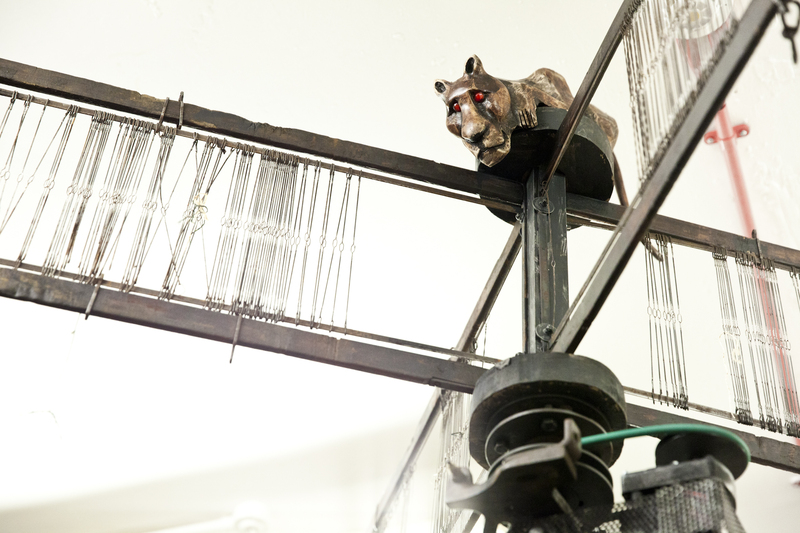 They loved the big cat with the piercing red eyes at very top, crouching on the old loom boards that have been repurposed into helicopter rotor blades. There were many others; some more fantastical than others and less easy to identify as a species. Personally, I really liked the monkey with the fishing rod and the bell on the end, as well as the bear with the irrepressible expression. And of course there was the one humanlike figure, turning a big wheel with both hands, in a clear representation of the weaver. Light and sound play an important part too. At first there are spotlights and then washes of colour where the whole structure is bathed in pink, red, purple and blue and then plunged into darkness. It is complemented by a score that begins, appropriately, with a waulking song before segueing into a modern instrumental, that is much slower, deeper and darker. A’ Bheairt has been on show since early October and is the grand finale in the Harris Tweed Festival, which has been running at An Lanntair since July. It also included the photographic exhibition by Ian Lawson and the Harris Tweed Festival day in August, which featured the Harris Tweed bike ride and fashion show in the evening. There were themed Harris Tweed tours too — but for me, the A’ Bheairt commission is the one that is artistically and intellectually closest to the spirit of Harris Tweed. It is perfectly symbolic of the loom as a living thing — with its famous clack and rattle sounds and magically appearing fabric — and of the weaver as a gothic master craftsman. Just as the stonemasons personalised their pillars, columns and archways with gargoyles and flourishes, so have Sharmanka brought the fallen-silent loom back to life once more, this time in an alternative reality, populated with woodland animals and other fantastical creatures. Apparently one lady who saw the exhibition asked “do all looms have these little animals on them?” How fabulous that would be. There is a fascinating and moving documentary on show alongside the Sharmanka loom, however, which does give some insights into the workings of Sharmanka, particularly the character of Eduard who grew up in communist Russia and still doesn’t have any English despite living in Glasgow for more than 20 years. Roddy Murray, Head of Visual Arts and Literature at An Lanntair, has wanted to do a dedicated Harris Tweed project with Eduard — “the presiding genius of Sharmanka” — for years but had not been possible until An Lanntair won Creative Scotland’s Creative Place award in 2015, which brought with it extra funding. A’ Bheairt is part the Creative Place award’s Bealach Project, delivered by An Lanntair in partnership with other organisations in Lewis and Harris. Delighted to have finally realised the dream, Roddy hailed A’ Bheairt as the “anchor project in the Harris Tweed Festival and a fitting conclusion to the summer season we had celebrating the cloth”. An Lanntair have hosted Sharmanka exhibitions twice before. Back in 2005, the Travelling Circus visited and was followed by Gothic Kinetic a couple of years later. These visits gave Roddy the ideas. “It came to me that there was potential for an amazing cultural mash-up, knowing their enthusiasm for the islands, mechanical engineering, folk art and tradition. “For most of the 20th Century, Harris Tweed was woven on Hattersley pedal looms on island crofts. In the end Eduard Bersudsky was given licence to reinvent and reconfigure an authentic Harris Tweed loom into a new machine. It was taken apart in Ken Roddy’s old loom shed, a process overseen by Sergey from Sharmanka and captured on camera by Robin Mitchell, Sharmanka’s associate photographer. The pieces were then packed away and driven to the Sharmanka studio in Glasgow where Eduard turned them into something different altogether. The whole process of creation took around a year and every step has been documented by Robin, who was happy — as were Eduard and Tatyana — to return to Lewis. He had previously been here for a university project in which he photographed the mills. In a rather strange portent, he had called that project ‘24 Bobbins to Balallan’. Robin said the islands and the mechanical aspects of the Harris Tweed industry were both “so photogenic” and it is a shame that more of his beautiful photographs were not used as part of the exhibition — although I have used them liberally here, with his kind permission. It would have been nice if they had been displayed in the foyer and the cafe bar as well, at least for a little while, in order to carry the Sharmanka vibe through the rest of An Lanntair. Fortunately for us, An Lanntair own this incredible piece of work and are currently looking for a permanent home for it. Discussions are underway with Museum nan Eilean, which would be perfect. “Lewis is its home, after all,” said Roddy.